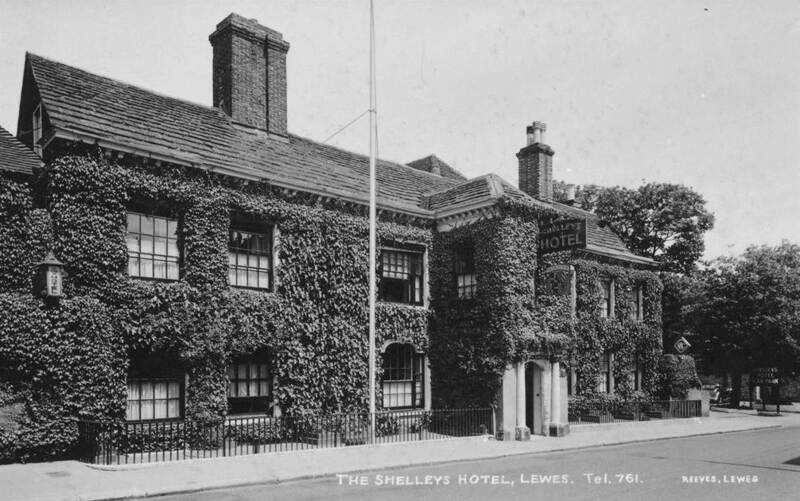 This Monday’s talks will cover three quite different studies, on three rather different Lewes streets and at three different stages of development, in our ‘Lewes Streets’ project. These ‘work in progress’ presentations will cover the studies’ aims and objectives, and report results to date. As usual all will be welcome, and we shall be serving coffee and biscuits prior to the talks. 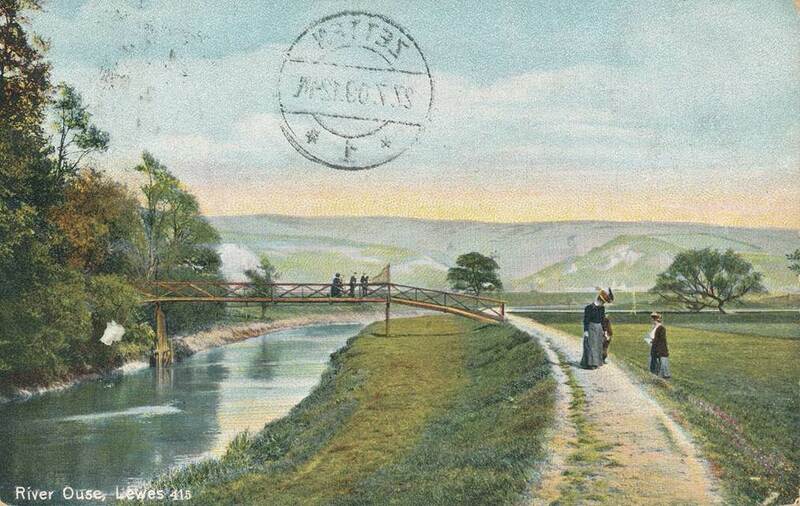 This postcard of the walkway along the River Ouse, featuring the old footbridge across to Malling, was mailed from Lewes to Zetten in the Netherlands in 1909. The Coombe can be seen in the background, across Malling Brooks. On 1 January 1597 Thomas Pelland of Southover, yeoman, and John Pelland of Lewes, berebrewer, son and heir apparent of the said Thos. Pelland, bargained and sold to Thomas Sackville, Lord Buckhurste, Knight of the Garter and Privy Counsellor, for £500 the capital tenement or messuage called the Vyne, with a dovehouse, brewhouse, maltinghouse, 2 barns, 2 stables, a close of land, a herb garden, etc, and also another tenement sometime Richard Adame’s adjoining to the West part of the Vyne containing 2 stables and one close. All these premises were in the parish of St Peter also St Marye in the Burrowe of Lewes. The properties bounded east to the tenement called the Chappell house then Richard Jefferayes, gent. and to a garden of the said John Pellande late Wm. Lane’s, gent. ; bounded west to the tenement and garden of John Tull; bounded north to lands called the Wallandes; and bounded south to the Queen’s highway through the said Burrowe of Lewes. The said premises were all in the tenure of the said John Pelland and John Hyder. The document was signed by the vendors, though their seals have been cut off, and the witnesses to the sale were Harberte Springett, Edmund Aspten, Edward Newton and Clement Athurst. At this date, a few years before the end of the reign of Queen Elizabeth I, the Vine was evidently an inn, complete with its own brewery, and you would doubtless also find home-made pigeon pie on the menu. Today it is known to us as Shelleys, after some later owners. The purchaser in 1597 was Lord Buckhurst of Knole, soon to be the first Earl of Dorset, who became enormously wealthy in the course of his devoted service as the Queen’s Lord Treasurer. ‘Capital messuage’ can be translated as ‘mansion’, but it is unlikely that, with Knole at his disposal, the buyer will have intended to live here himself. 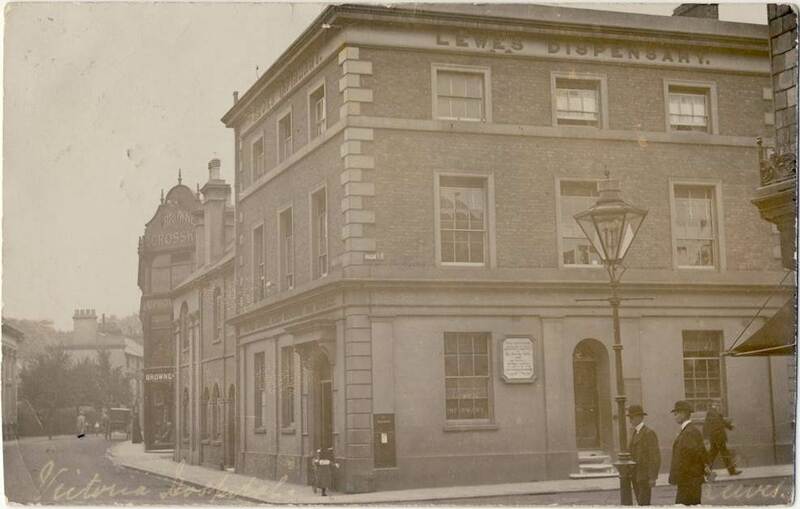 A beautiful image of ‘Lewes Dispensary’ at the bottom of School Hill, on the corner of Friars Walk. The signs in the ground floor windows read ‘Lewes Infirmary’ and ‘Victoria Hospital’ respectively. A few details to note are the small girl minding a pram whose handle she could barely reach outside the door, next to the Post box set into the wall, and the commemorative plaque on the wall. Along Friars Walk is Browne & Crosskey’s Furniture Showroom and just visible at No. 1 Friars Walk is the Railway Inn. The corner of first Lewes railway station, by this date redundant in this role, can just be seen to the extreme left. Source: a local newspaper cutting from c.1939 preserved by a former nurse at Lewes Victoria Hospital. Poile Ward, presumably named after this matron, was closed as a rehabilitation ward only within the last two years, as in-patient care has now been transferred to the individual rooms of the adjacent Meadow Lodge. “Miss Eleanor Poile, matron of Lewes Victoria Hospital for the past 28 years, is retiring next week, and she will undoubtedly receive from a host of friends and hundreds of former patients best wishes for a long and well-earned rest. Many Lewes residents will no doubt remember the old Lewes Victoria Hospital and Dispensary at the foot of School Hill, which was given up in 1910 and at which Miss M.E. Wood was matron for many years. 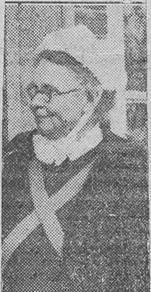 In 1911 the present hospital was opened and for a short time Miss Thorpe was the matron-in-charge, but then Miss Poile was appointed and since then she has carried out her responsible duties with great sympathy and devotion, thousands of patients having passed through her hands during the past 28 years. Miss Poile came to Lewes from the General Hospital at Walthamstow, where she was in charge of the casualty and men’s wards. Interviewed this week, she gave us an interesting resume of the work of the hospital and of its increased work since she first came to work in the county town. She pointed out that no one could have received greater help or more consideration from all connected with this fine institution or from the townspeople generally than she had received. “Everyone has been most helpful,” she said, “and I should like to acknowledge publicly the kindness I have received on every hand”. During the past quarter of a century the work at the hospital has increased very considerably and has necessitated increases in accommodation. “There were very few motor cars about when I first came to Lewes,” said Miss Poile, “and the number of accident cases we have had to deal with in consequence of the continuous increase in motor traffic has risen enormously”. When the hospital was first opened there were only 14 beds and three cots. It was not until four or five years afterwards that four beds were allowed for use by paying patients, but this of course made a difference to the financial side of the undertaking. Later casualty, receiving and X-ray rooms were added, and these were important and much-needed additions. In 1911 the total staff, including the matron, comprised one sister and three probationers. Now, in addition to the matron, there are four sisters, three staff nurses and from five to seven probationers in training. About three years ago a commodious new nurses’ hostel was built close to the hospital, which enabled the first floor of the hospital to be converted into private wards to accommodate eight paying patients, and two years ago the hospital itself was enlarged, so that with the eight beds in the private wards there is now accommodation for 32 adults and three children. 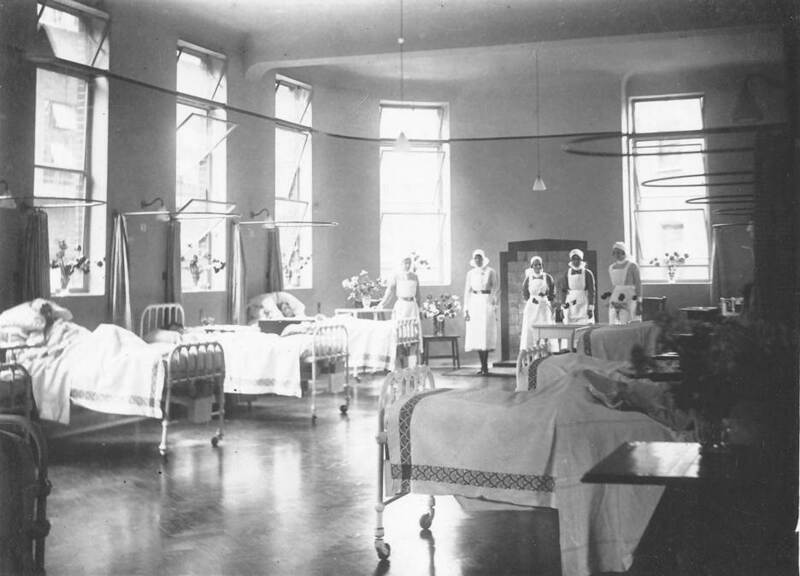 All sorts of modern conveniences were included in the scheme and these included a doctor’s room, an anaesthetic room, improvements to the operating theatre and the installation of an up to date range in the kitchen. There is now also a massage room. The total cost of the improvements was £10,000. Today £1,786 is needed to clear the debt. Naturally the increased accommodation has meant a considerable addition to the annual maintenance costs. During the past 28 years there have been many anxious times financially but they have been overcome and the Hospital Penny Fund and the Lewes Carnival have brought in a considerable revenue. Another great source of help has been the Linen Guild, formed some years ago under the presidency of Mrs F. Verrall. This position was later held by the late Mrs G. Vere Benson, and now Miss Fanshawe is president of this useful organisation. Today the hospital is one of the best-equipped institutions of its kind in the county and much of its success has been due to the untiring energy and devotion of Miss Poile. Although she will be greatly missed by a host of friends, it is pleasing to be able to note that after a holiday she hopes to be able to return to live in or near Lewes. A ward photograph, from the same source. 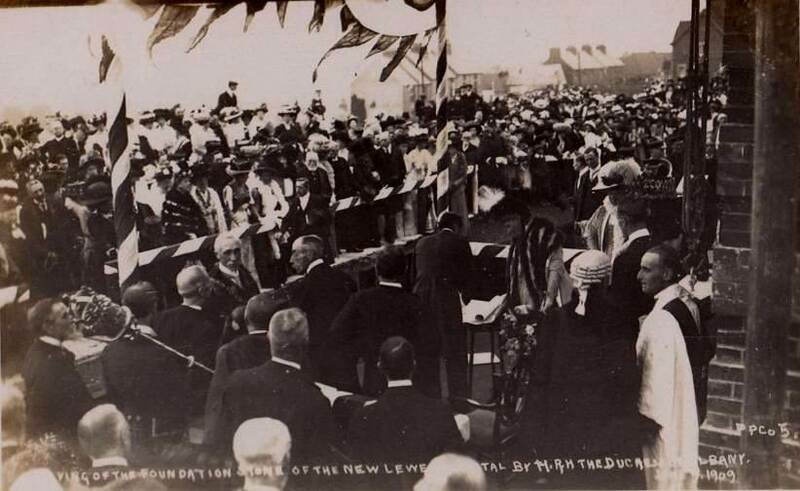 Her Royal Highness the Duchess of Albany laying the foundation stone of Lewes Victoria Hospital in 1909, in the presence of an assortment of local people and civic dignitaries. Princess Helena Frederica Augusta (1861-1922), the daughter of George Victor, Prince of Waldeck & Pyrmont, had married Queen Victoria’s youngest son, Prince Leopold, in 1882, to become the Duchess of Albany. The couple were distant cousins, both descended from King George II. Prince Leopold, a haemophiliac, had died after a fall in 1884, so the Duchess had been a widow for 25 years by the time she came to lay this stone. Leicester Road is one of the streets that has not, as yet, made an appearance in our ‘Lewes Streets’ project. The main part looks to be a single development, and on quite a large scale for its period, but when, by whom and with what market in mind? If it was indeed a single development it must have involved a pretty substantial investment by somebody, or by some group. 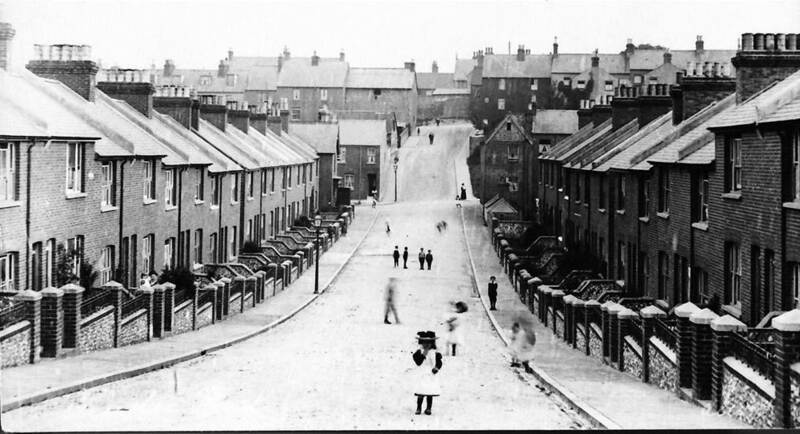 Surprising how wide the car-less road and pavements appear in this photograph taken about a century ago, when streets were for children to play in. Anyone interested in taking this on as a project? This entry was posted in Biographical Literature, History of Medicine, Lewes, Local History. Bookmark the permalink.